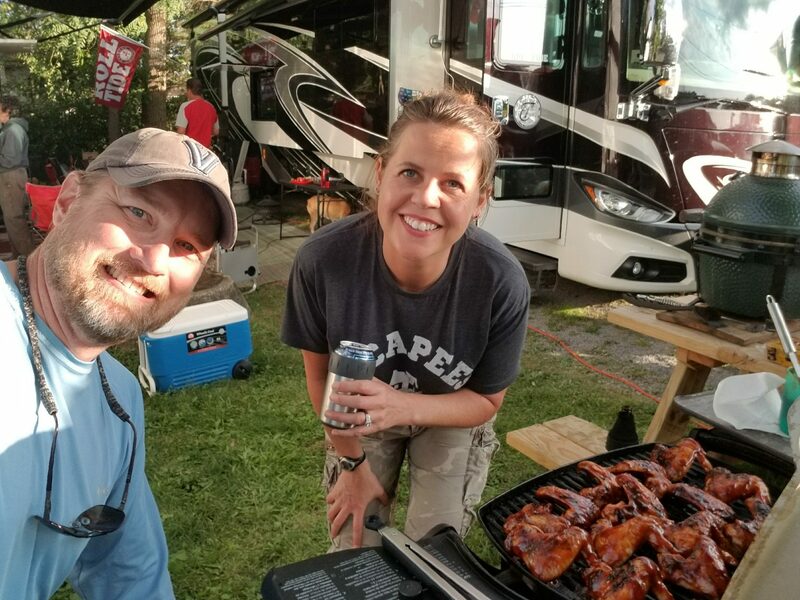 After taking 5 months off from RV rallies, we got back into it again in August as we started the month in Indiana at the Forest River Owners Group (FROG) rally. We had a great time last year at the FROG rally. 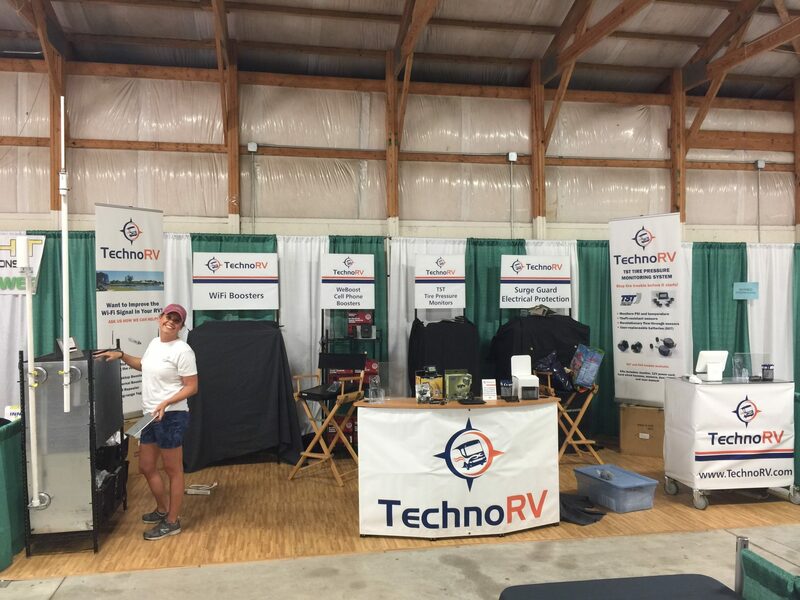 We met a lot of great RVers, and we sold a lot of products. This year was a bit different. We met lots of great people, and got to hang out with people we had met last year, but we did not do that great as far as selling products. This is just part of being a vendor at a RV show; sometimes you do good and sometimes you don’t. None the less, we will be back at the FROG rally because they always deliver on the good times. Thanks to everyone that came by our booth to visit with us. At the FROG rally we met up with our friends Luke and Jody. We met them in Arkansas at the Workamper event and had a great time in Utah with them in April. 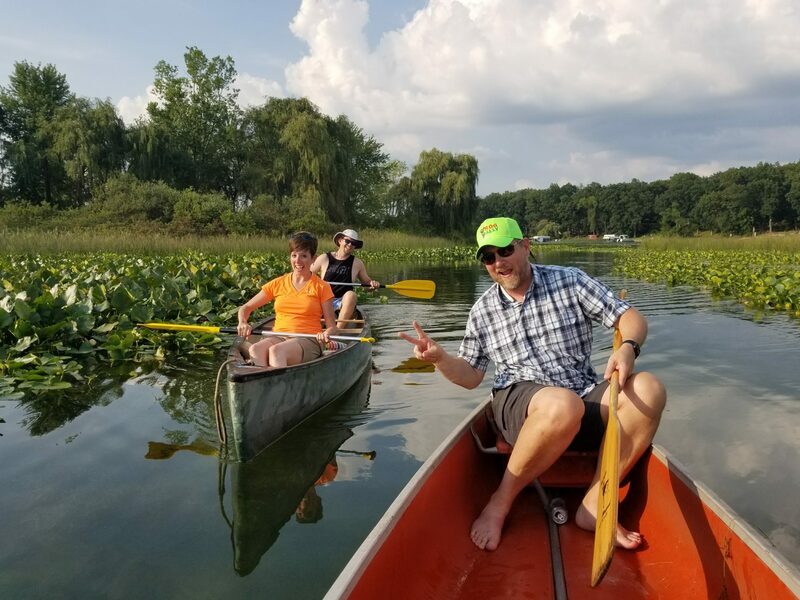 We took some time to go kayaking with them and plenty of hanging out during the rally. 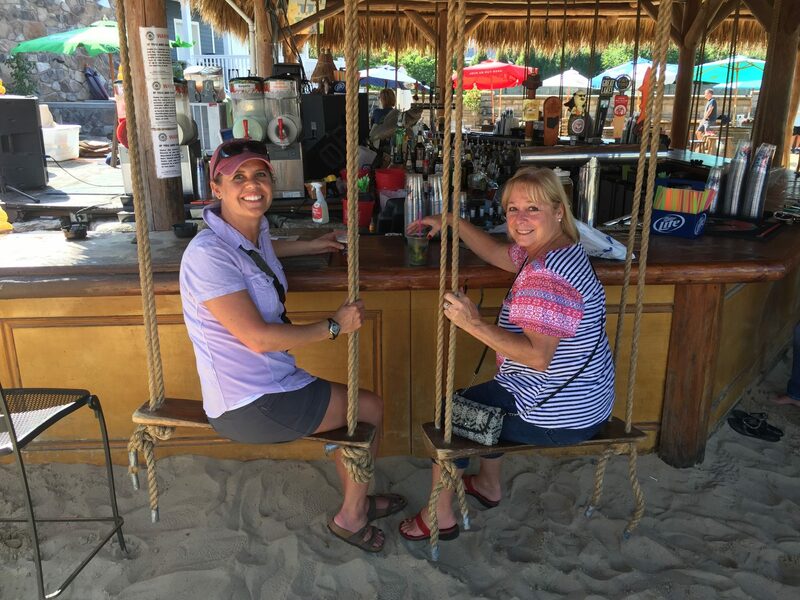 Of course, Diane and Gayle (FROG volunteers) were a couple we met last year, and we had a good time spending time with them. 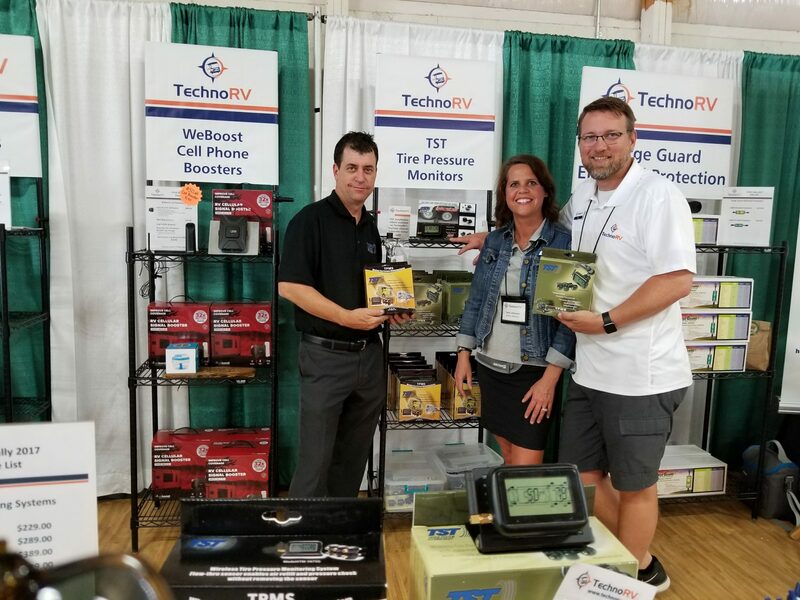 Usually when we go to RV shows we like to walk around and see the vendors and support them. So at the FROG rally I picked up some new Big Foot jack pads, Wash/Wax all products, and I got me a vinyl “Roll Tide” sticker made. Tami picked up some Tupperware and Norwex products so she was happy about that. After FROG we made our way to Traverse City, Michigan. I was excited because I was determined to book a boat to go fishing. 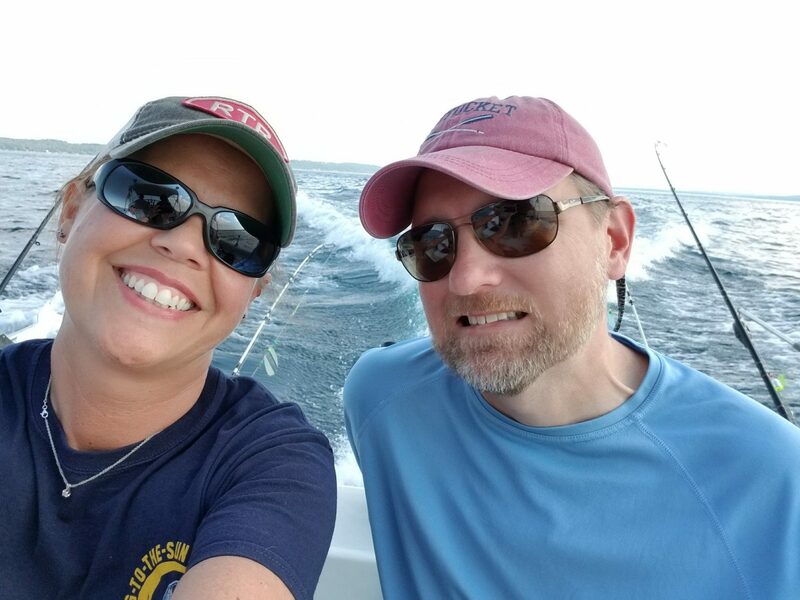 Tami and I love fishing but have not gotten to do it at all this year. 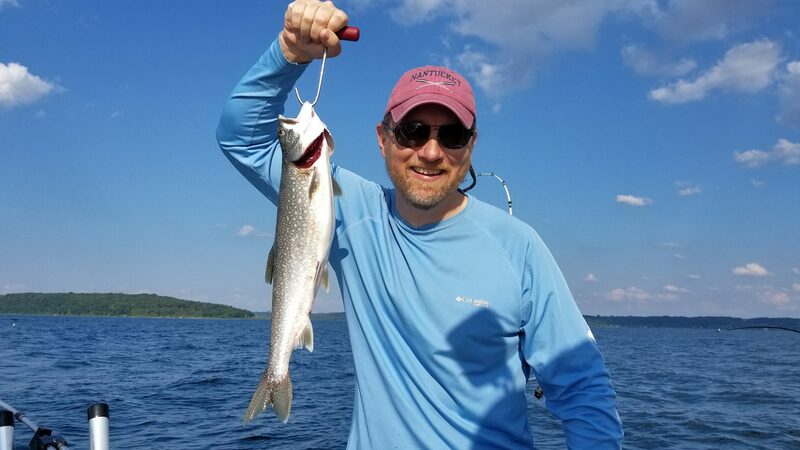 We booked a fishing charter boat to go catch some lake trout on one of the Great Lakes. We thoroughly enjoyed being on the boat, but the fishing was rather uneventful. It was one of those deals where the captain puts lines out, and then when a fish hits the line they hand you the fishing rod and you reel it in. We only caught 3 and the one I reeled in I couldn’t even tell I had one on the line. Overall, just being on the water was great. 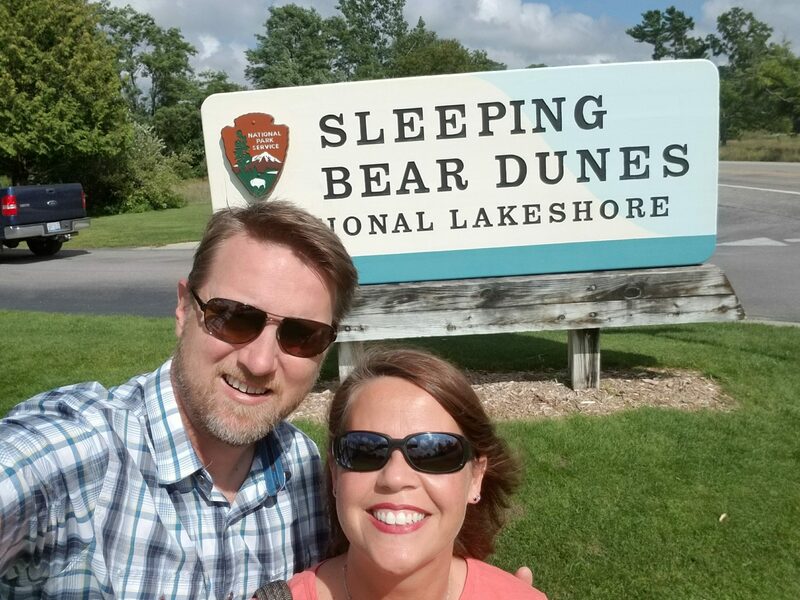 One day, we took a ride over to Sleeping Bear Dunes. I’m trying not to sound grumpy here, but I didn’t get the appeal of this. There was a big sand hill that you walk up, and that is pretty much it. We did it to get the sticker, but probably wont be a place we go back to. 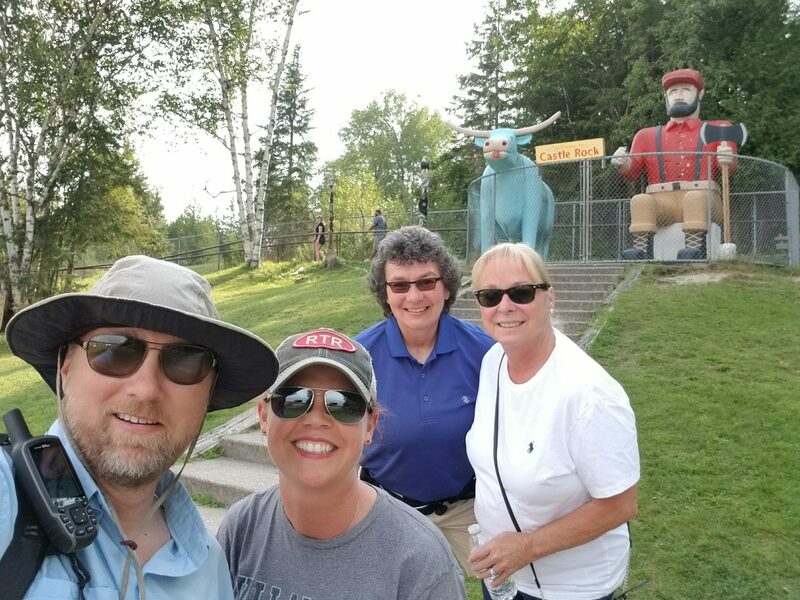 Next up was a trip to the Upper Peninsula and Mackinac Island. When we went to Mackinac Island we took our e-bikes with us. The trip around the island is 8.2 miles and we did it two times. The problem is that at the end of the day a policeman pulled up to us on his bike and proceeded to tell us that e-bikes are not allowed – oops. We were already headed out for the day anyway, but we sure did fly around the island in record time while we were there. 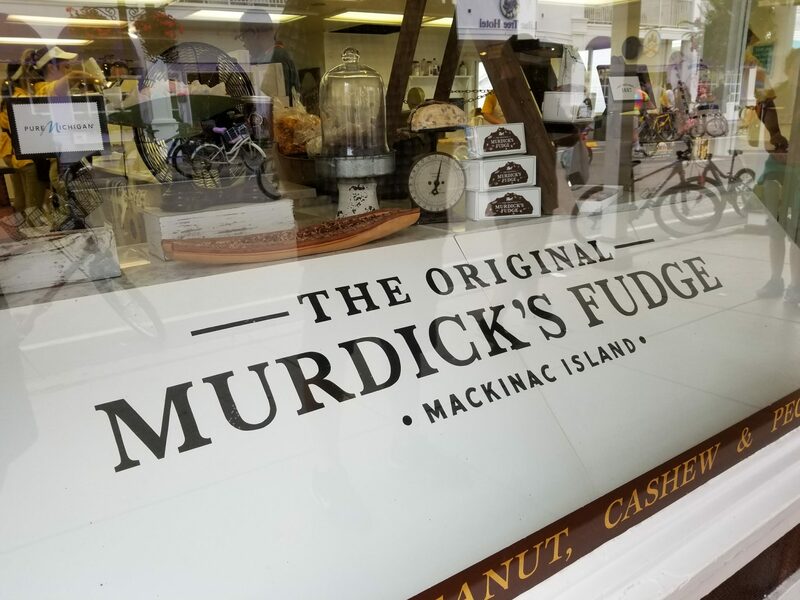 Also, apparently fudge is a big thing on the island, and of course, we could not resist leaving with a large amount of it. While we were in the area we also climbed Castle Rock. This is just a short climb, but there were some pretty good views at the top. After visiting the UP, we then went to Ohio and stayed right near Lake Erie. We took the Ferry to Kelley’s Island and rented a golf cart to see the sites. What a great place to visit. Just being near the water and having a beer as the boats go by reminded us of home. Next to Kelley Island is Put-in-Bay and we also took a ferry over to this island. 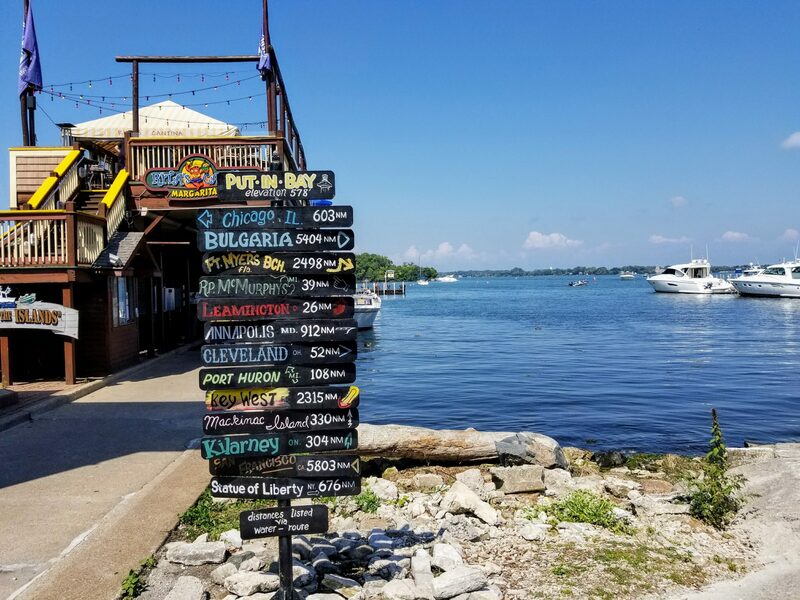 We went to Put-in-Bay last year and loved it. The boardwalk has a restaurant with the best Lobster Bisque, and there are so many beautiful boats in the marina. While we were on the island we noticed there was a big concert the next day. Toby Keith was playing and as we were leaving the island there was a 45 foot Prevost coming off of the Ferry, and guess who it was. Yep, Toby Keith. We almost went back, but did not have the time. Guess who is learning to play the Ukulele? Yep, Tami bought a Ukulele and is going to give it a shot. I have played guitar for dozens of years, and so she is going to join in on the fun. She seems to be a natural so far. Maybe me and Tami will start a band and play at RV parks! We have ended August in New York and plan to go to Niagara Falls while we are here. We went last year, but did not go to the Canadian side, so that will be the plan. August was packed full of adventure and fun. College football is starting so I know what Ill be doing for the next 12 Saturdays! Roll Tide! Previous Post: July 2017 – Crater Lake, Redwoods, and a Mouse in our RV!